JustforJeeps.com has the appearance parts you need to keep your Jeep looking like new. 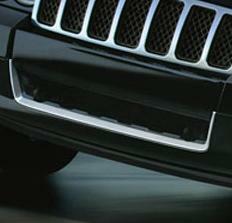 This chrome insert fits the front bumper cover of the 2008-2010 Jeep Grand Cherokee Overland models. Replacing a damaged or tarnished insert restores the looks of your Jeep. This insert is not designed to fit the Laredo or Limited models without modification of the bumper cover or insert.